Firearms, including handguns, are very popular to purchase. As a Fairfax criminal lawyer, I know that some people are so excited or anxious to buy the perfect weapon they have found at the right price — whether for recreation, safety or both — at a gun dealer or gun show that they might fail to be meticulously honest and accurate in their state and federal firearms purchase application. As a Second Amendment-supporting Virginia lawyer, I believer in the right of people to own weapons and to seek Virginia concealed carry permits if they wish. It is critical to follow weapons laws to the T, to avoid being arrested and prosecuted for such offenses as carrying a concealed weapon after the concealed carry permit expires, bringing a firearm into an airport or other prohibited place, traveling to states whose handgun laws are stricter than Virginia’s, and possessing a handgun after having been convicted of a disqualifying crime. At that point of being clearheaded — after the excitement of finding the right handgun has subsided — the gun purchaser is at less risk of filling out the form incorrectly, thus reducing the risk of being prosecuted for allegedly making misstatements on the firearm purchase form. 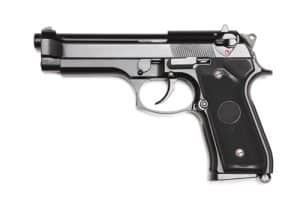 Potential and actual handgun purchasers are wise in advance to fully familiarize themselves with the federal and Virginia state handgun purchase forms, which respectfully are here and here. For those considering applying for a Virginia concealed carry handgun permit, that application form is here. The Virginia and federal firearm purchase applications are not duplicates of each other. Virginia law criminalizes making a materially false statement both on the Commonwealth of Virginia and the federal ATF (Bureau of Alcohol, Tobacco and Firearms) handgun application. Va. Code § 18.2-308.2:2. The ATF firearms application requires disclosing whether the applicant has been convicted of a misdemeanor crime of domestic violence, which includes a Virginia conviction for domestic assault under Va. Code § 18.2-57.2. This month, the Virginia Court of Appeals affirmed a conviction for failing to disclose such a conviction on the ATF form. Marshall v. Virginia, ___ Va. App. ___ (Jan. 15, 2019. Virginia is one of the nation’s most Second Amendment-friendly states. Following the federal and state weapons laws and using them safely is essential. Fairfax criminal lawyer Jonathan L. Katz since 1991 has successfully defended scores of clients charged with firearm crimes, and thousands of people charged with alleged felony and misdemeanor offenses. To discuss your case with Jon Katz, please call his staff at 703-383-1100 to schedule a confidential consultation.